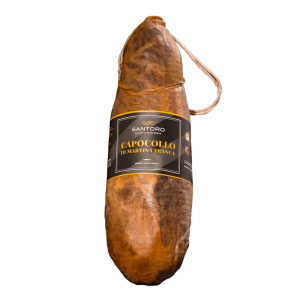 The idea of one, the enthusiasm of the other, the mastery of both: from the meeting between Santoro and Lenti, the Pancapocollo, Panettone with Capocollo of Martina Franca, is born. 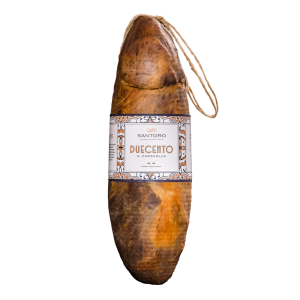 Piero and Giuseppe, master butchers known for their Capocollo of Martina Franca of Salumificio Santoro and Emanuele, master of the panettone in Grottaglie with his Pregiata Forneria Lenti, counted among the 25 best masters in Italy, come together to create a new product, a surprise for sweet lovers and a pleasure for savory ones. 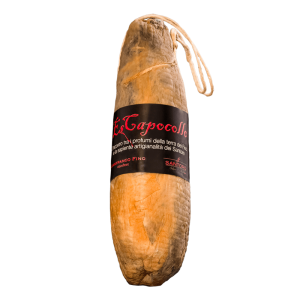 The Pancapocollo is born from the magic that is created between butter, eggs and raw mother dough that welcome the Capocollo of Martina Franca Santoro, and with a slow natural leavening they become a soft emotion, to be consumed lukewarm.